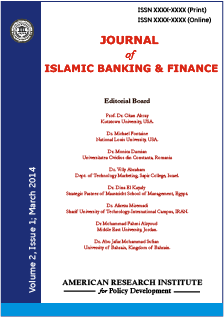 Journal of Islamic Banking and Finance is a refereed international journal. The aim of the journal is to be the leading outlet for the best research in Islamic banking and finance. All papers are subject to a minimum of double blind refereeing. The journal publishes the papers that provide in-depth insight and analysis into current issues within Islamic finance and bank management, Issue- or results-focused case studies, illustrating research and product developments, and instances of best practice. It provides comprehensive cover of research in this expanding area which will serve as a central repository for research in the field, bridging the interests of scholars and practitioners and bringing the results of research and product development to the attention of the international financial and business management community. E-Publication FirstTM is a feature offered through our journal platform. It allows PDF version of manuscripts that have been peer reviewed and accepted, to be hosted online prior to their inclusion in a final printed journal. Readers can freely access or cite the article. The accepted papers are published online within one week after the completion of all necessary publishing steps. Each paper published in Journal of Islamic Banking and Finance is assigned a DOI®number, which appears beneath the author's affiliation in the published paper. Click HERE to know what is DOI (Digital Object Identifier)? Click HERE to retrieve Digital Object Identifiers (DOIs) for journal articles, books, and chapters. CrossRef, CrossCheck, Cabell's, Ulrich's, Griffith Research Online, Google Scholar, Education.edu, Informatics, Universe Digital Library, Standard Periodical Directory,Gale, Open J-Gate, EBSCO, Journal Seek, DRJI, ProQuest, BASE, InfoBase Index, OCLC, IBSS, Academic Journal Databases, Scientific Index. Prof. Yousef Jahmani, Ph.D., CPA, Savannah State University, USA. Dr. Faisal G. Khamis, Department of Banking and Finance, AL-Zaytoonah University of Jordan. Dr. Mohammad O. Al-Smadi, Department of Banking, Al Imam Mohammad Ibn Saud Islamic University, Saudi Arabia. Dr. Hasan Dincer, Department of Banking and Finance, Beykent University, Turkey. Dr. Marina Mustapha, Taylor’s Business School, Malaysia. Prof. Dr. Nisar Ahmad, Imperial College of Business Studies, Lahore, Pakistan. Dr Hodo B. Riman, Department of Banking and Finance, University of Calabar, Nigeria.